While the SUV market is downsizing, some buyers still need rugged and utilitarian four-wheel drives that can carry seven people and go off-road — seriously off-road. That’s where the Toyota Landcruiser Prado Altitude and Mitsubishi Pajero GLS come into play. Both of these big SUVs are built in Japan and both boast proper off-road credentials thanks to low-range transfer cases, differential locks and over 200mm of ground clearance (220mm and 225mm respectively for the Landcruiser Prado and Pajero). Situated around the middle of both manufacturer’s model ranges, the run out limited edition Landcruiser Prado Altitude starts from $65,600, while the Pajero GLS is $58,990 — both inclusive of automatic transmissions and plus on-road costs. In terms of sales in the large SUV segment, the Landcruiser Prado is a sales king, regularly selling over three times more units than the Pajero. Despite the sales difference, both vehicles offer compelling arguments in this space. We hit the road with the aim of finding out which vehicle was best, both on and off the road. The Landcruiser Prado has been around in its current form since 2009, benefitting from several minor facelifts along the way. The Pajero on the other way has been around for quite some time — almost ten years, to be precise. Mimicking to some degree its larger Landcruiser 200 Series sibling, the Landcruiser Prado features a prominent grille that proudly wears the Toyota badge up front with teardrop headlights. The high bonnet line follows the car’s lines along the sides to the rear where wrap-around taillights sit on the corners. Our test car had the spare tyre — which normally sits mounted to the rear — relocated underneath the vehicle. This feature of the Landcruiser Prado Altitude opens up a split tailgate at the expense of a second smaller petrol tank. The added convenience allows the driver to retain the main 87-litre fuel tank for a driving range of more than 1000km, while also gaining the convenience of a door that can be opened even in tighter car parks where a swinging door wouldn’t suit. Privacy glass and classy side steps also feature on the Landcruiser Prado Altitude, with gloss-finished roof rails adorning the roof. Despite its almost 10-year run on the market, the Pajero still looks modern and rugged. Clear headlights and a slatted chrome grille integrate LED daytime running lights and fog lamps. Chrome-finished wing mirrors and brushed-aluminium side steps follow straight sidelines to the rear of the car, where a spare tyre hangs on the side-opening rear door. The Pajero GLS also features privacy glass and roof rails, completing what is a pretty rugged design that looks set to take on any terrain you can throw it at. As you step up from terra firma into the cabin of the Landcruiser Prado, it feels somewhat dated. The dials and switches mostly feel great and are synonymous with ‘modern’ Toyota, but the trims and plastics feel cheap in some places. On the upside, there are a number of handy storage areas, a huge centre console and chunky steering wheel with a number of audio, telephone and cruise controls. The 7.0-inch infotainment system features a 14-speaker JBL sound system and uses DAB+ digital radio, along with Bluetooth, auxiliary and USB inputs. The clever system also integrates satellite navigation with live traffic updates and the ability to receive text messages via the screen. An auto-dimming rear vision mirror is joined by a tilt-and-slide sunroof and Blu-ray rear entertainment system with three sets of wireless headphones, making it a feature-packed offering. Dual-zone climate control for the front row is mated to rear climate control for the second and third rows. The first row is comfortable and offers power leather-trimmed seats that allow for plenty of leg and headroom. It’s the same story in the second row, where ample leg and headroom is available for both younger kids and adults. Another handy feature is being able to recline the second row backwards and forwards to further enhance passenger comfort. The third row, though, is a kid-only zone. The legroom is fairly limited — although the second row can slide forward to accommodate third-row passengers with more legroom. The third row flips up easily and is just as easily pushed back down. While operating the third row of seats was easy, we found ourselves getting dirty from the rear skirt each time we leant in to grab the seat handle. With seven airbags, rear-parking sensors, electronic stability control and a reversing camera fitted as standard, the Landcruiser Prado Altitude is jam-packed with safety gear. Stepping inside the Pajero GLS is like going back in time. The older style Mitsubishi steering wheel is flanked by a dot-matrix-like LCD screen between the speedometer and tachometer, along with an older-style screen above the infotainment unit. The infotainment unit itself also feels one or two generations old, but comes with USB and auxiliary inputs and Bluetooth audio streaming with six-speakers. Single-zone climate control for the first row operates separately to the temperature control for the second and third rows — unlike the dual-zone climate control on offer in the Landcruiser Prado Altitude. Like the Toyota, the Mitsubishi has plenty of leg and headroom up front for first row passengers. Equally, the cloth seats with leather look bolsters are comfortable and come with electric adjustment and heating. The second row offers plenty of leg and headroom and folds forward to provide easy access to the third row. The third row of seats fold flat into the floor of the Pajero GLS. Unlike the Landcruiser Prado Altitude, there is a huge storage cavity beneath the floor once the seats are up. But, the downside is that the seats are not as easy to use; they take much longer to erect in comparison. Kids will love the third row, while adults won’t. It offers little leg room for adults and is ideally suited to younger kids. The swinging rear door is also impossible to use in city car parks or when hard up against walls. It can also be heavy with a full-sized spare tyre hanging off it. With six airbags, rear-parking sensors, electronic stability control and a reversing camera fitted as standard, the Pajero GLS is also jam-packed with safety gear. Other notable features include bi-xenon automatic headlights and automatic windscreen wipers. Under the bonnet of the Landcruiser Prado Altitude there is a 3.0-litre four-cylinder turbocharged diesel engine that produces 127kW of power and 410Nm of torque. The dated engine is about to be replaced by a more powerful diesel engine, but in its current form it consumes just 8.5L/100km of fuel on the combined cycle. The engine is mated to a five-speed automatic gearbox that allows the Landcruiser Prado to tow up to 2500kg braked, or 750 unbraked. 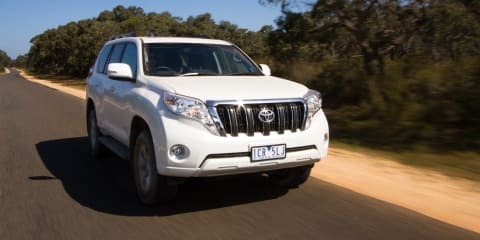 On the open road, the Landcruiser Prado Altitude gets along nicely, but needs a run up and a full-throttle hoof for overtaking or manoeuvres that require sudden speed changes. From a standstill, the Landcruiser Prado can feel like it needs an eternity to get moving if the turbocharger is caught off boost. The steering offers limited amounts of feel and can be vague about centre. While this is fine when off-road, it can be a little troubling on country roads with open and sweeping corners. The brakes, like the steering, could do with more pedal feel. The pedal is spongy and doesn’t communicate what is going on at the tyres as well as it could. While most owners won’t fuss much over handling, the Landcruiser Prado feels more settled than the Pajero through corners. It sits flatter and the constant all-wheel drive system better manages the distribution of torque when throttling out of corners. In the other corner, the Pajero GLS offers a slightly bigger and more powerful 3.2-litre turbocharged four-cylinder diesel engine. Producing 147kW of power and 441Nm of torque, the slightly lighter Pajero GLS gets along with a greater sense of urgency in comparison to the Landcruiser Prado Altitude. Mated to a five-speed automatic gearbox, both vehicles offer manual gearshifts to control ascents or descents with ease. The Pajero’s power advantage comes at the cost of fuel use, averaging 9L/100km. The steering feels heavier, but offers more accuracy in return. Likewise the brakes feel better underfoot than they do on its Japanese counterpart. Even from a standing start, the Pajero GLS is able to leapfrog the Landcruiser Prado Altitude with its more even spread of torque and lighter mass. 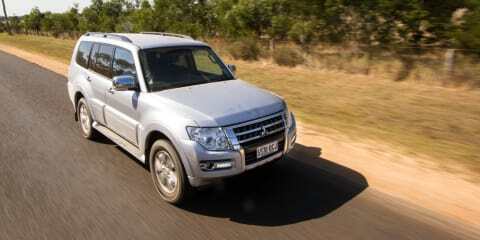 Unlike the Landcruiser Prado, the Pajero isn’t normally driven as a full-time four-wheel drive. Its default road mode is rear-wheel drive, with the all-wheel drive system activated for off-road use. As a result, the Pajero rolls on its outer wheels more. It’s also more likely to twitch at the rear thanks to its regular rear-wheel drive operating mode. As I mentioned earlier, most owners are unlikely to ever notice this. The Pajero is capable of towing more than the Landcruiser Prado, courtesy of its 3000kg braked and 750kg unbraked towing capacity. These cars were built with one thing in mind — tackling any terrain thrown at them. Both vehicles feature all-wheel drive systems with low-range gearboxes, locking differentials and a raft of off-road electronic driver aids. The Landcruiser Prado Altitude comes with the least amount of kit, only offering a centre differential lock, low-range gearbox and a downhill assist control. Despite having less gear, the Landcruiser Prado Altitude felt more capable off-road than the Pajero GLS. We attacked a dry off-road track and utilised the Landcruiser Prado’s Downhill Assist Control, which variably brakes individual wheels relative to the vehicle’s angle of descent. The car was able to descend a steep hill with ease and I felt like I was constantly in full control. While the system was very loud inside the cabin, it was easy to use and very effective. In reverse, this time going up the hill, I was able to keep the throttle continuously on between half and three quarters, and the Landcruiser Prado Altitude simply climbed with little fuss. When a wheel did pitch into the air, the traction control was able to limit wheel spin and direct torque to the wheels with available traction. The four-wheel drive controls were all easy to use and navigate, limited to a switch for transitioning between high and low range, a button for activation of the centre differential lock and finally a button to activate the hill descent control. The Pajero GLS comes with additional four-wheel drive kit, including a centre and rear differential lock and a low-range gearbox. It also has the ability to operate as a two-wheel drive or four-wheel drive vehicle on the fly, helping reduce fuel consumption. Controlling the Pajero GLS down the steep descent was a little harder, given it doesn’t feature a hill descent control. So the only option was to manually select a lower gear and use the brakes. On the way up the hill, the traction control felt like it was doing a lot more work than it did in the Landcruiser Prado Altitude. Locking the rear differential helped limit wheel spin, but it required forethought and a greater deal of driver intervention. Suspension articulation and extension felt greater in the Landcruiser Prado Altitude than it did in the Pajero GLS. This was part of the reason the Pajero GLS didn’t feel as capable, given the tyres often couldn’t extend to reach the ground in areas the Landcruiser Prado Altitude could. Either way, both vehicles were incredibly capable off-road — unquestionably more capable than the tests we put them through. There are certainly better options on the market if you simply need a seven-seat SUV that occasionally goes off-road. But, if you often need to carry seven adults and do serious off-road driving, these two cars are reasonably priced and tick the right boxes for form and function. Of the two, it’s the Pajero GLS that feels the most dated. The ancient interior and infotainment system alone make it a difficult proposition to promote. The Landcruiser Prado Altitude, on the other hand, is modern in terms of infotainment and features, and also in terms of design and driving technology. With an engine update just around the corner, the Toyota Landcruiser Prado Altitude is our pick of serious seven-seat off-roaders.